Salt Lake Comic Con is a great show. If I point out problems, it’s because I want the show to be better, but I can now state with confidence that it’s a really good show. My panels were a blast, and had good crowds. The panel discussions weren’t quite as erudite or deep as the panels at literary-focused genre events like LTUE, LDStorymakers, or the GenCon Writer’s Symposium, but those are events for writers, and the SLCC panels were, for the most part, events for fans (some of whom are writers, but they’re a small minority.) The important thing for this show is that the panels were fun–at least the ones I was involved in. I did catch a little mumbling from attendees coming out of one panel or another along the lines of “I was hoping it would be about…” or “I wish they’d covered…” but I think that’s as much an issue of setting the audience’s expectations as it is about delivering the goods. Sandra had good panels as well, and that’s important to me. As a micro-publisher, editor, designer, and writer, she has at least as many important things to bring to a discussion as I do, and at Salt Lake Comic Con she got to bring ’em, and she came back from her events at least as energized as I did. Oh, and we made decent money. 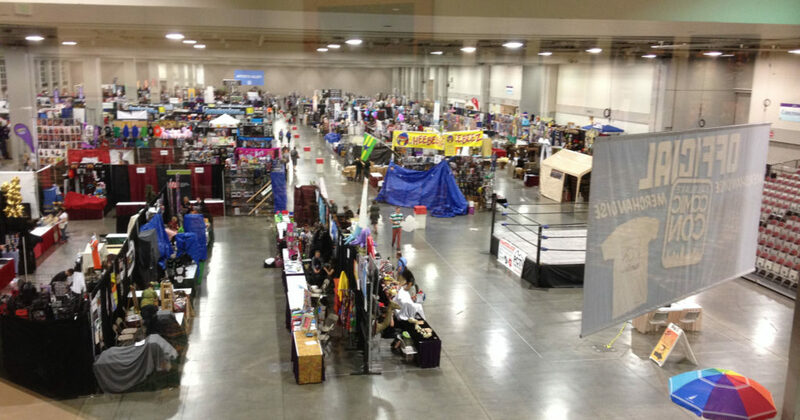 Return-wise, the first SLCC was the worst large show I have ever done. The second barely broke even. This one, though, made twice as much for us as the first two put together. Finally I can look at the event with confidence and start planning my year around doing it regularly. Admittedly, I don’t know what the average attendee’s experience was. I think most folks at the show were there to stand in line for celebrity signings or photo-ops, and that’s way outside my area of interest. The fans who showed up at my booth were happy, and they were fun to talk to. These pictures obviously don’t do the crowds justice. 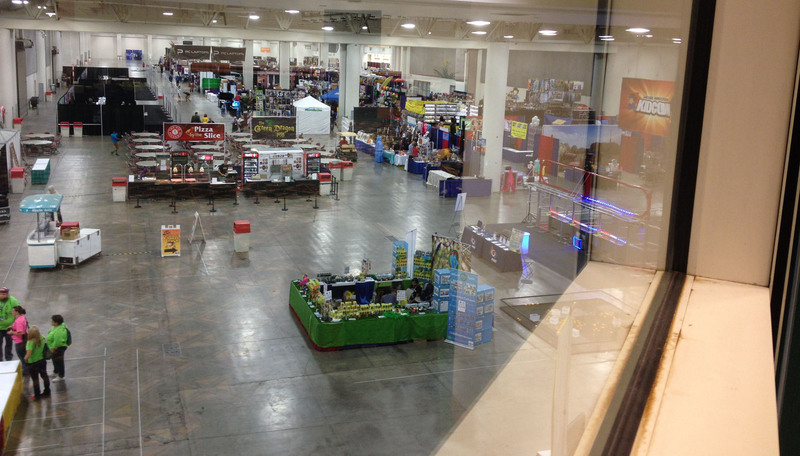 From my booth, which was in the southwest corner of the south wing, it took about 15 minutes to get to booths or events on the west end of the west wing… unless I flashed my exhibitor’s badge and slipped out and back in through the loading docks. Get everybody into the hall within 3 hours on Thursday. Issue badges via mail, and open the on-site registration on Tuesday and Wednesday. Attendee names on badges, at least for the adults, the vendors, and the professionals. Lock in the panel schedule 60 days in advance. But the show was wonderful, notwithstanding the problems I’ve described. Sandra and I have already begun planning how best to exhibit and attend the “Fan Experience” version of this event in April. The lines at Salt Lake Comic Con on Thursday were astounding. The turnout was absolutely amazing. And appalling, because these lines were for picking up VIP and GOLD badges. If people wanted to just pay at the door and get into the show with a wrist-band, they could walk straight in, but tens of thousands of pre-registered attendees stood outside for hours waiting to pick up their badges. Meanwhile, thousands of vendors and presenters waited inside the building wondering where everybody was. 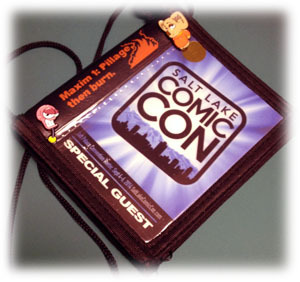 The problem is that Salt Lake Comic Con hoped to process 100,000-ish registrations in advance by having people come to satellite locations for badge pick-up throughout Salt Lake and Utah Counties. These were open (and obviously under-utilized) on Monday, Tuesday, and Wednesday. Why didn’t it work? Because Salt Lake Comic Con expected customers to change their behavior. They expected these people to go out of their way, to make a special trip out just for badges. You don’t solve a problem of this scale by asking 100,000 people to act differently. You modify your OWN process so that their existing behavior becomes part of the solution. This is event management 101. Put on big-boy pants, Salt Lake Comic Con, and do what the real conventions do: mail badges to people in advance. You’ve got tens of thousands of enthusiastic fans pre-registering with credit-card numbers. Collecting a mailing address during pre-reg is easy. But how bad is the problem, really? Simply put, people who paid in advance for three days of convention will only get two days. Dan Farr and the Salt Lake Comic Con organization know this. If badges don’t go into the mail for the next show, Dan Farr knows that he’s taking a day of the convention away from tens of thousands of people whose money he took. My real concern, though, is whether the thousands of people who got turned away from entry after waiting in line all day Thursday will ever bother coming back. This is the third time that Salt Lake Comic Con has failed to get paying attendees through the door in a timely manner. I applaud folks like my friend Nick, who is their head of security, who scrambled on-site to make the most of a terrible situation. I’m pleased with the good behavior of the attendees who did make it inside, and who set aside their frustration and anger and enjoyed the show for the hour or two they were able to. I’m excited to be part of such a big, enthusiastic show. Of course, I was inside the building at 9am as a vendor, and by around 4pm I was seriously wondering where all the people were. Find Me This Weekend at Salt Lake Comic Con! I’m at Salt Lake Comic Con this Thursday, Friday, and Saturday! Schlock Mercenary merchandise will be in booth 1600, but that number is misleading. We’re at the west end of Aisle 700, right across from The Pie Pizzeria booth. My full schedule is below, but the booth will be staffed the whole time the expo hall is open. 1:00pm-5:30pm: Expo Hall, Booth 1600 – I’ll sign and sketch in books at no charge. If it gets slow, I’ll be penciling and inking strips. Come watch me work! 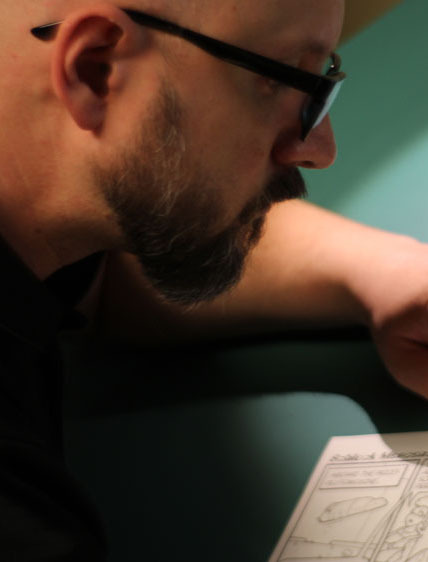 6:00pm-6:50pm: Room 251 – Choose Your Own Apocalypse! It’s an audience-participation game show type thing in which each of the panelists tries to woo the audience over to their point of view. 7:00pm-8:00pm: Expo Hall, Booth 1600 – signing, sketching, and working on the comic. 2:00pm-2:50pm: Room 255C – Inside Schlock Mercenary! All that behind-the-scenes stuff… ask me anything! 5:00pm-5:50pm: Room 251a – Writing and Mental Health with Robison Wells. 7:00pm-7:50pm: Room 255F – Writing Excuses Unplugged, with Brandon Sanderson and Dan Wells. It’s going to be a very busy show for me. I’m sharing booth space with Brian McClellan, so even when I’m not on stage I’ll probably be goofing off in entertaining ways. I probably shouldn’t promise that. But come see us!